When you first put a CD/DVD into the Playstation 2, the disc spins enough so that the laser can read if it's a CD, DVD movie, DVD ps2 game or CD ps1 or 2 game to spin at the appropriate speed. If there is no disc inside, or the laser thinks there is no disc inside, the disc will only spin that 1/2 of a turn. So what would cause the laser to think there is no disc inside? A dirty laser. Try cleaning the laser and see if it helps. If you can see crust or dust covering the laser eye, it may not be strong enough to read anything at all. If the laser looks clean, this is probably not the issue. An unplugged laser cable. These things normally do not come out by themselves, but if you opened the ps2 that was spinning OK to clean the laser and/or removed the laser to clean it, plugged it in, now it's spinning 1/2 of a turn, the laser cable may not be in securely. If it is in securely, make sure it is plugged into the motherboard end properly. Click HERE for picture help in doing so. A dead laser. On models 30001, 35001, and some 30001R, this is the most likely issue. These models are old and the original lasers were a bit unreliable. You can purchase a laser from our website by clicking HERE. I would suggest using a 400C since it is a better laser [and more available] than the 400B. YES, despite anything you have read, you CAN replace a 400B with a 400C IN ALL CASES. Since the 400B became very rare back in October, we have been using 400C in ALL of our 400B repairs. If you do not feel comfortable diagnosing your PS2 or even opening it, click the link below to get an estimate for repair. For us to clean a laser, we charge 24.95 -- that includes cleaning, return shipping, and a 30 day guarantee on the cleaning. For us to replace a laser, we charge 69.95. That includes a NEW laser, installation, and shipping back to you. 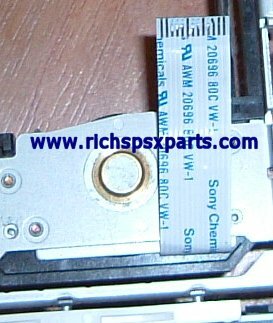 FOR MORE INFORMATION, VIDEO, AND PICTURE TUTORIALS, CLICK HERE TO PURCHASE THE PS2 TROUBLESHOOTING AND REPAIR GUIDE, CREATED BY ULTIMATECONSOLEGUIDES.COM.